Today in Masonic History Andrew Michael Ramsay passes away in 1743. Andrew Michael Ramsay was a Scottish-born writer. Ramsay was born in Ayr, Scotland on January 9, 1686. In his youth, Ramsay was drawn to George Garden a leader in the early Episcopal Church. Ramsay studied at Garden's community in Rosehearty, Scotland where they practiced quietism. Quietism was popular in the 1670's and 1680's before being banned by Pope Innocent XI for heresy. Quietism encourages contemplation instead of meditation, silent thought instead of vocal prayer. It also replaces the Holy Trinity with the Godhead. The Trinity being three different beings in one entity and the Godhead refers to the divinity or substance of God. The Trinity can be defined as "who" God is and the Godhead can be defined as "what" God is. Quietism would lead Ramsay to live around Europe, particularly in France. In 1710, Ramsay traveled and met Madame Guyon who was a French mystic and leader in the Quietism movement. Unlike the movement from 30 to 40 years earlier, Madame Guyon instructed her followers to focus on the idea of Pure Love. Although she never required anyone living in her community to convert to Roman Catholic, she encouraged it and Ramsay converted to Catholicism. 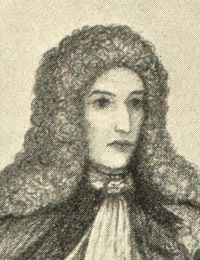 While in France Ramsay became involved with the Jacobite movement. In 1721, Ramsay wrote a essay which was later expanded and re-released the following year regarding the politics of Britain. In the essay he advocated for the restoration of James Francis Edward Stuart to the throne. He also advocated for the removal of the House of Commons in favor of an aristocratic senate which would advise the King. He would soften on the idea of the removal of the House of Commons in a later work. In 1723, Ramsay was knighted to the Order of St. Lazarus of Jerusalem, which was originally a group of crusader knights who protected pilgrims heading to the Holy Land during the Crusades. The following year he headed to Rome where he became a tutor to Bonnie Prince Charlie (also known as The Young Pretender) when he was 3 and a half years old. Ramsay supported Bonnie Prince Charlie's father claim to the British throne along with the other Jacobite's. The young Bonnie Prince Charlie and court intrigue caused Ramsay to return to Paris in the same year. When he returned to Paris, Ramsay began writing his most famous work The Travels of Cyrus which was released in 1727. The book got him international attention. In 1729 he traveled to London and was elected a member of the Royal Society. Ramsay passed away on May 6th, 1743. It is unclear when Ramsay became a Freemason. It is believed that he became a member of the Fraternity when he traveled to London in 1729. Regardless when he joined, back in France he became associated with Freemasonry there and was the Grand Orator of the Grand Orient of France. In 1737 he wrote Discourse pronounced at the reception of Freemasons by Monsieur de Ramsay, Grand Orator of the Order, which he delivered as a speech. In it he for the first time connected Freemasonry with the Crusader Knights. This was a departure from the generally held opinion that Freemasonry evolved from the Operative lodges of Europe. In his speech he never once mentioned the Knights Templar, although it is believed that his reference to Crusader Knights was a veiled reference to the Knights Templar. In 1737 Ramsay sent the speech to Cardinal Fleury, chief minister of Louis XV, who was the highest religious authority in France. In his correspondence he asked the Cardinal for a Church blessing on the principals of Freemasonry stating "The obligations imposed upon you by the Order are to protect your brothers by your authority, to enlighten them by your knowledge, to edify them by your virtues, to succor them in their necessities, to sacrifice all personal resentment, and to strive after all that may contribute to peace and unity of society." It is believed that at the time the Church was already having problems with the deviating principles of the Society of Jesus (Jesuits), along with the fact that Masonic Ritual was seen as preposterous, Cardinal Fleury refused to offer his blessing. It is also believed that the veiled reference to the Knights Templar, an organization that was still looked upon poorly in France, caused the Papal ban on Freemasonry the following year.